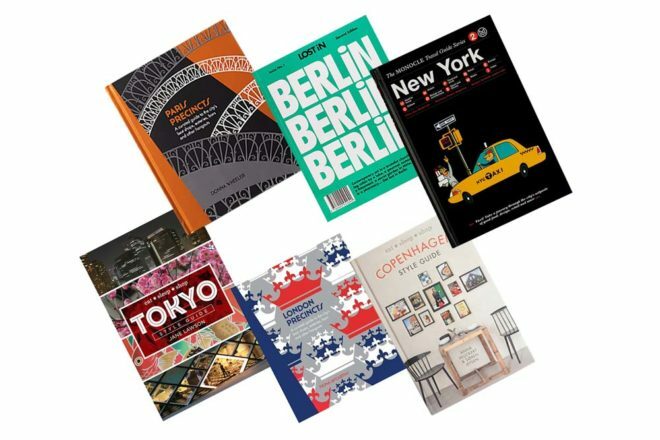 6 practical yet funky travel guides to London, Berlin, New York, Copenhagen, Paris, Tokyo. This collection of practical city guides highlight the absolute must see, do and eat in cities both fabulous and funky. Prepare to see London, Berlin, Paris et al through a brand new filter. Don’t get lost in one of the most densely populated cities in the world, this handy guide that will show you the best places to drink, eat and shop your way through all 18 London precincts. One for the hipsters and those who like to explore a city away from the tourist sites, Lost in Berlin speaks to an award-winning sommelier, an international gallerist, a famous fashion blogger and an arts publisher to get under the skin of Berlin, a city that thrives on being different. With a bureau and a shop in New York, Monocle is better placed than most to really get to the heart of the world’s favourite thriving metropolis. As a result it has produced a definitive city guide to New York, detailing what the Monocle crew knows and loves about the place and its surrounds, presenting a few surprises along the way. Lifestyle, food and fashion writer Peuckert explores the Danish capital through its design, taking in everything from fashion to architecture to dining out. Her relaxed tone is perfectly complemented by photographer Søren Jepsen’s warm and unaffected images. Beyond the iconic sites, Paris is a city of neighbourhoods. Wheeler breaks down the French capital into areas and discovers the real elan of the city at street level. With more than thirty years travel experience to Japan, Jane Lawson knows how to navigate her way through this vibrant and bustling city. Find out where all the hip neighbourhoods are, so you don’t miss a thing.